Some of the best golfers to ever swing a club, including major winners Tom Watson and Bernhard Langer, have suffered from the dreaded yips. 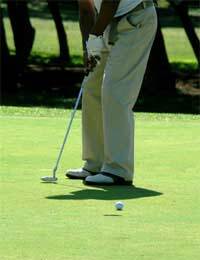 The inability to make a smooth stroke while standing over a short putt has driven many amateur golfers round the bend. Engineer Sean McKendrick came close to turning his back on the sport for good when the yips wrecked his confidence and caused his handicap to climb well into double figures. “I started playing the game as a boy and had been golfing happily for almost 25 years when the yips struck,” recalled Sean, a 39-year-old from Aberdeen. “My handicap was down to five and I was competing in amateur competitions in Spain and Portugal as well as all over the UK. “I can’t put my finger on the exact moment it happened. It seemed to sneak up on me and before I knew it I had the yips. At first, my mates thought it was hilarious and looking back now I can just about see the funny side. It wasn’t funny at the time though, and I got so down about it that even my mates stopped laughing. In a way that was worse, because every time I missed a short putt there was just an awkward silence. “I’d turned into this sad character unable to hole a putt between two and six feet. No-one dared mention the yips, never mind discuss it, because I was, to say the least, a bit touchy about the subject. “I was pointed in the direction of a psychiatrist who was a member of the golf club and he was absolutely fantastic. He explained how my self-inflicted mental anguish escalated with every putt I missed and how my fear of missing a putt triggered physical responses – increased blood pressure, shallow breathing and tightened muscles. That, in turn, made it more likely that I would miss. “The psychiatrist told me the key was to focus on something other than the putt itself, and he suggested I turn my attention to my breathing pattern. I did this, breathing in as I took the putter back and breathing out in one long, smooth, even breath as the putter moved forwards towards the ball. This relaxes the muscles, apparently, and, for me at least, it worked.